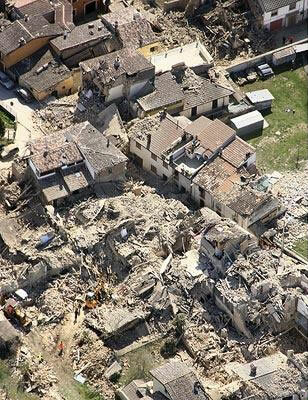 Six Italian seismologists are under indictment for failing to warn the people of L'Aquila about the magnitude 6.3 earthquake that struck the city on April 6, 2009. The quake killed 308 people, injured more than 1,600 and left 65,000 people homeless. On March 31, six days before the large earthquake struck, Italy’s Civil Protection Agency held a meeting with the Major Risks Committee - composed of the six scientists - to assess the risk of a major earthquake. At that time, the committee concluded that there was "no reason to suppose a sequence of small earthquakes could be the prelude to a strong event" and that “a major earthquake in the area is unlikely but cannot be ruled out." At a press conference after the meeting, government official Bernardo De Bernardinis, deputy technical head of the Civil Protection Agency, told reporters that "the scientific community tells us there is no danger, because there is an ongoing discharge of energy. The situation looks favorable.” In addition to the six scientists, De Bernardinis is also under investigation. According to the group of local citizens, many of the earthquake’s victims had been planning to leave their homes, but had changed their minds after the committee’s statements. "Those responsible are people who should have given different answers to the public,” said Alfredo Rossini, L'Aquila's public prosecutor. “We're not talking about the lack of an alarm, the alarm came with the movements of the ground. We're talking about the lack of advice telling people to leave their homes." Nearly 4,000 scientists from around the world have signed a letter urging Italy's president to focus on earthquake preparation and the enforcement of strict building codes rather than castigate scientists for what they cannot do - predict earthquakes. 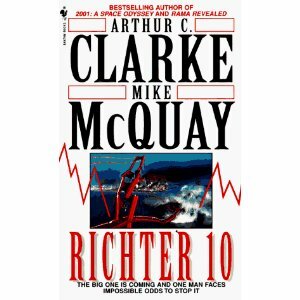 Earthquake prediction is still science fiction; Clarke fans may recall Richter 10 which Sir AC Clarke published with Mike McQuay in 1996. In the novel, seismologist Lewis Crane develops a unique theory of earthquake prediction; will America believe him when he predicts an astonishing Richter 10-level earthquake?